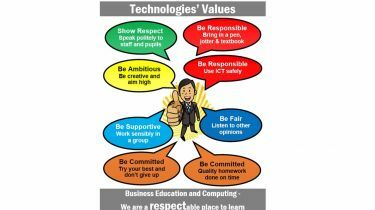 Students who display our department values may be recognised by being presented with a highly sought after 'Technology Tam' badge. These are available in gold, silver and bronze. In addition students can nominate their classmates if they feel they have demonstrated these values. All students are being encouraged to use their Office365 account. This is basically their account to save files and it also has an email facility. We are encouraging students to use this in their classes, specifically in Business Education and Computing but also for their other subjects when they wish to save and access files. All students have to do is go to office365.edin.org and log in with their username and password. We have created a help sheet so that students can get full use - see link below. Reminder - You can use your Office365 account to create and save and even email your Business and Computing Word of the Week homework just go to office365.edin.org, sign in and go to your email. You can also access and save your work in the OneDrive. Revision and consolidation for N4, N5 and Higher should be ongoing and there are some brilliant resources, tasks, YouTube clips on BrightRedBooks.net for all these subjects. You need to register but it's easy to do so. Get involved. Our department slogan is “developing your skills, making you employable” as our courses play an important role in preparing students for employment both by extending their understanding of business and also how IT is used and applied in all aspects of society. In both Business Education and Computing, we use group work, investigations and student presentations to develop confidence and communication skills. In addition we are keen to develop students skills in problem solving, literacy, numeracy and creativity, all essential skills that will make students more employable and benefit those that wish to go onto further or higher education. Parents - documents to help you!